Cadillac advances its legacy of technologically driven performance and luxury with the Hydra-Matic 8L45 paddle-shift 8-speed automatic transmission, which debuts with the all-new 2016 Cadillac CT6. Matched with the next-generation 3.6L V-6, the 8L45 transmission is based on the same acclaimed General Motors-designed eight-speed automatic family introduced on the Corvette Stingray – with the higher-capacity 8L90 version paired with the CT6’s available 3.0L twin-turbo V-6 engine. The 8L45 eight-speed shares the architecture and design features of the Hydra-Matic 8L90 transmission, but it is scaled and calibrated for the performance envelope of the new 3.6L V-6. It also incorporates components to support the engine’s stop/start technology. Stop/start shuts down the engine to reduce fuel consumption when vehicle comes to a complete stop, and it automatically restarts the engine when the driver takes his or her foot off the brake pedal. In addition to stop/start efficiency, the 8L45 eight-speed’s wide 7.0 overall ratio and numerically lower top gear offer an up to a GM estimated 5 percent fuel economy benefit over a comparable six-speed automatic transmission. A numerically higher 4.62 first gear ratio also helps drivers start off more confidently, with a greater feeling of immediate performance. 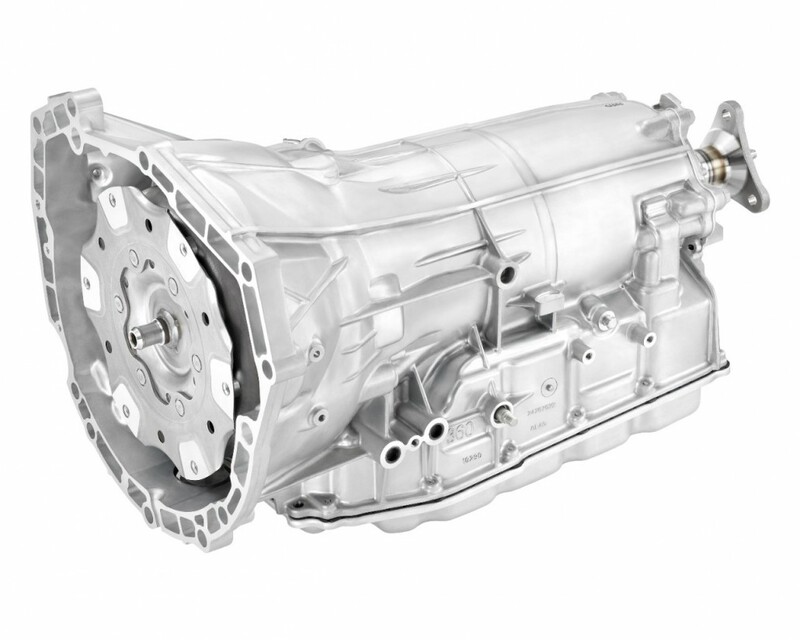 With four simple gearsets for optimal efficiency and five clutches (two brake clutches and three rotating clutches), creative packaging enables GM’s eight-speed automatic to fit the same space as the previous six-speed automatic, with a lower weight. The new 8L45’s smaller package size enables approximately 33 pounds (15 kg) mass saving compared to the 8L90 eight-speed – a transmission that was already lighter than GM’s 6L80 six-speed automatic. Smaller steps between gears, compared to a six-speed transmission, keep the engine within its optimal rpm range, making the most of its horsepower and torque to optimize performance and efficiency. Additionally, friction-reducing design features – including synthetic fluid – and lower spin losses via a powerflow that uses only two open clutches per gear and an off-axis binary vane pump contribute further to efficiency. The torque converter design with turbine damper enhances refinement, particularly during low-speed gear changes, for smoother performance. More than 1,100 computer-aided engineering analyses were made during the development of the Hydra-Matic eight-speed transmission family – resulting in more than two dozen patents – to ensure strength, durability, performance and refinement. The transmission controller is mounted externally and its processor executes hundreds of calculations and commands every 6.25 milliseconds. The Hydra-Matic 8L45 and 8L90 transmissions are built at GM’s Toledo, Ohio, and Silao, Mexico, transmission facilities. They will also be offered in the 2016 Cadillac CTS and ATS, including CTS-V and ATS-V.